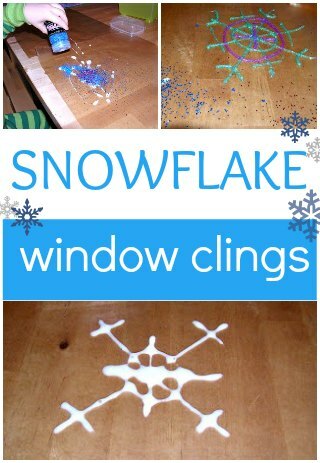 Did you know you can make snowflake window clings out of glue? The kids and I are constantly decorating our windows since our view is less that stellar. Sometimes we paint the window, or create cellophane stained glass. We’ve also made rainbow window snowflakes from Wikki Stix, but you can never have do too many snowflake crafts. UPDATE: This snowflake “stained glass” window project is now our very favorite way to put snow on the window!!! All you do is squeeze ordinary glue on to wax paper which, when it dries, can be easily peeled off. After squeezing out his glue, Kiddo proclaimed, “This is a very interesting snowflake!” Indeed. First we tried it with white glue and sprinkled glitter but then I realized, duh, wouldn’t glitter glue be sooo much easier. Plus, glitter glue is one of Kiddos favorite things. The next day we had a group of colorful new indoor snowflakes. Kiddo thought this one made a pretty bracelet! UPDATE: Two things make the clings work better: adding a squirt of dish soap to the glue, and wetting the clings with water before sticking to the window. We’ve also used puffy fabric paint and they cling to the window a lot better. For paper snowflake ideas check out what to do with paper snowflakes. 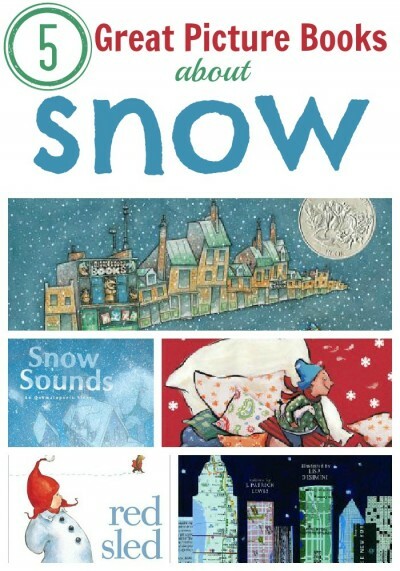 Don’t forget to read a few snow books! We did this same thing before Christmas with glittery fabric glue. I don’t know how white glue would work, but you can stick the ones made with fabric glue onto windows. We have several lovely window-cling snowflakes gracing our windows still! Great idea – will have to try later on when my son is older (he is 26M)! This just blew my mind! Awesome! Are you saying ordinary white glue works?!?! Sign me up!